Th-INK-ing of You: You Make Me Happy! Hello friends! I do hope you are all well and avoiding the flu this season, as well as all the other multiple things going around right now! This certainly has been a tough flu season here and is not close to being over from what I hear... but we are thanking the Lord that we have avoided it so far! I do have just a hint of spring for you (even while we brace for a little snow storm to come our way over night). I have some beautiful daisies, from the January release at ODBD. The stamp/die duo set is "Call to Me". 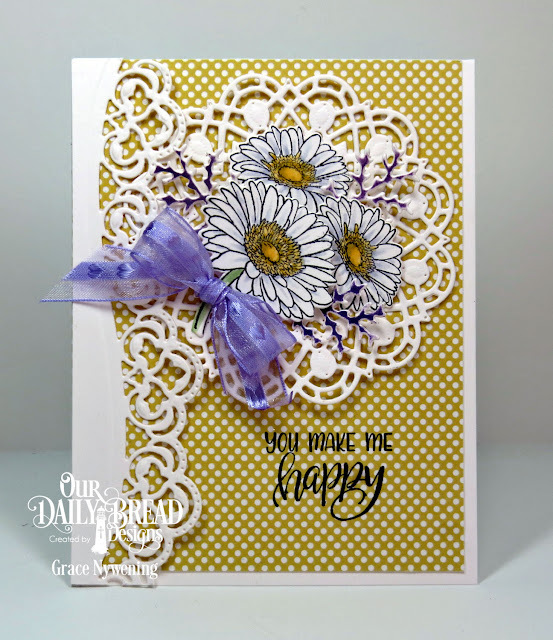 I stamped, then die cut with the included die, and arranged on a white Doily Die Cut. I also used a Leafy Edged Border die down the side of my card. The paper is from the Plum Pizazz Paper Pack, and the sentiment from the Call to Me set is stamped directly on the design paper. I few little sprigs were added (from the Lovely Leaves Die set which by the way is currently on sale), and a sheer bow was added to finish off this simple card. So that's it... a simple one but a fresh breath of spring! On a personal note I do cherish your continued prayers. I continue to struggle with side effects of current meds and pain issues. I truly do thank you for praying! I am working on my Bible Journaling and loving it more and more. If you are currently doing Bible Journaling... would you just let me know that in the comments below? I'm interested in how you got started and what mediums you like to use the most? I have two Bibles that I journal in. One is the Inspire Bible, which has many illustrations already in it, but spaces to do your own as well. It was a great way for me to start coloring in my Bible and in that one I have only used colored pencils. However, as I "grow" in the art, I am now beginning to prefer working in my other Bible, which has space to journal in, and no illustrations done for me. I love being able to bring out the verse or thought that the Lord laid on my heart from that Scripture reading... and I am stepping out with a little more courage to try my own art work. So I have actually tried some watercoloring in that Bible, and I'm working on my lettering... which has a LONG way to go! However... I am loving it!!! It has enriched my time with the Lord in so many ways... and has helped me remember better what I read. Last Sat. we began a Bible Journaling class at my church... and I was so excited to find so many other women who also love this expression of worship! So... if you live near me... feel free to come join us! Contact me for the details! I'd love to hear your stories of your journaling God's word! Hi Grace: what lovely card spring is coming and with card I see you are ready for it. You are always in my prayers. I love the new release with Beautiful flowers. You always do beautiful work and never dissapoint. Jan. release look back....Oh my!! !